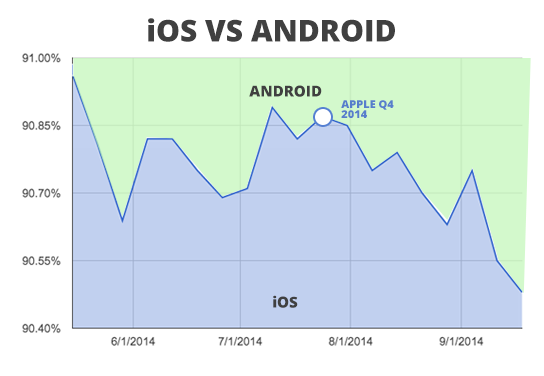 This week, Apple lost .07 percent of the mobile device pie to Android in the iOS-Android device wars. According to some back of the envelope assumptions, we've included a prediction for how doctors will adopt the iPhone 6 and iPhone 6 Plus over the next few months. Judging by the Apple store lines today, everyone's eager to get their hands on the newest and greatest iPhones. In our predictions, we considered device upgrades with carriers, usability of aging dinosaur devices, previous upgrade data, and willingness to stand in line. Not only will we see many of pMD's providers upgrade their current iPhones to the new iPhone 6 and iPhone 6 Plus, we will undoubtedly see Apple take back more of the mobile device market share from Android, who has slowly been creeping into the health care space.